Wedding bands typically feature a particular metal such as gold, silver, platinum, or in some cases, titanium. There is no scientific reason to believe that the substance of the metal (e.g., the titanium) has any direct influence on a person’s physical health or emotional well-being. Now, imagine dissolving that same metal in water so the resulting microscopic-sized particles could be infused into an item that could be worn or kept in close proximity. Would the resulting item provide a health benefit where the solid mass could not? All Phiten products incorporate a novel form of technology that involves metals broken down into microscopic particles dispersed in water. This process underlines [sic] the technologies of a variety of unique materials we possess. By utilizing the property of each material to a maximum extent, we are able to realize customers’ potentials in a variety of extents that leads to restore normal relaxation status of customers. This is the technology that supports more comfortable daily life. These “Aqua Metals” include titanium, silver, platinum, palladium, and gold. They are incorporated into several products such as necklaces, bracelets, tape, lotions, athletic supports, garments, sleeping goods, and “relaxation equipment.” Phiten also offers a “Phiten Room” where microscopic-particle titanium (MPT) can be permeated into wall surfaces to enhance relaxation. Those who are not familiar with Phiten might be surprised at the popularity of its products. The Phiten webpage currently offers a robust list of global contacts that, at present, includes locations in Europe, Asia, Australia, North America, and South America. The United States subsidiary, Phiten USA (www.phitenUSA.com), notes that there are over 130 Phiten retail locations in Japan and that Phiten started officially in Southern California in 1998. The Phiten USA timeline also refers to several well-known athletes who have served as Phiten representatives (including Jennie Finch, Carmelo Anthony, Josh Hamilton, and Hideki Matsuyama). Phiten was a corporate partner of University of Hawaii Athletics for several years and has had formal relationships with Major League Baseball (MLB), the National Basketball Association (NBA), and the National Hockey League (NHL). Phiten recently developed a baseball cleat with New Balance, a well-known athletic apparel company. Phiten’s products usually incorporate MPT, which is sometimes called “Aqua Titan” or “Aqua-Titanium.” Phiten’s titanium-treated necklaces seem to be particularly popular in baseball. Support for the theory that externally located MPT influences emotional well-being can be linked to two sources. The first is people who claim that MPT-treated products provide this benefit; if at least some of the reviews on Amazon.com are to be trusted, many people believe that Phiten necklaces alleviate pain or influence emotional well-being. The second source of support comes from a small number of publications promoting the potential health benefits of MPT. The Aoi et al. (2012) examination into the influence of MPT-treated surroundings provides the clearest implication that the external presence of MPT somehow influences emotional well-being. Aoi et al. randomly assigned office workers to sleep for five nights in quarters where the walls and floors were or were not infused with MPT. According to Aoi et al., their results “suggest that sleeping in a room containing titanium lowers physiological and psychological stress” (2012, p. 13). There are several reasons to be skeptical of this type of claim. One cause for concern is that research supporting the potential benefits of MPT is typically funded by Phiten, has an author who lists Phiten as the institutional affiliation, or both. The only exception was one article where the authors declared that there was no conflict of interest. This type of collaboration is not by itself improper, but it is possible that this corporate-research synergy could generate collectively biased results. Phiten-supported researchers might be less aggressive in publishing unflattering results, possibly creating a “file drawer problem.” They might also knowingly or unknowingly overlook potential problems in their research methodologies. At the very least, it seems fair to suggest that the scientific community will have difficulty embracing the purported benefits of MPT without support from researchers who are clearly independent from Phiten. Another concern is that Phiten’s promotion of MPT and other Aqua Metals simply sounds like pseudoscience. The term pseudoscience can be used unfairly, so let us offer specific examples. First, support for Phiten’s products is largely anecdotal (Shermer 2002). Second, there is no clear mechanism to explain how one variable influences another (see Thagard 1993), and even Phiten-funded researchers report that the mechanism between MPT and improved health “remains unclear” (Aoi et al. 2012, p. 17). Third, the variety of purported benefits associated with MPT might resemble pseudoscience in terms of sounding extraordinary (e.g., Hines 2003). Even the single implication that MPT can diminish the ever-present problem of stress would likely be the psychological discovery of the decade. Fourth, the theory that externally located MPT provides benefits appears to be constructed so that it can only be confirmed (e.g., Hansson 2013). This seems evident in the small necklace packaging disclaimer that states, “Not all users will experience the intended benefits of Phiten products, and individuals must try it for themselves to see whether it works for them.” This disclaimer suggests that positive results can be attributed to the necklaces while negative results cannot. Fifth, MPT appears similar to other externally worn accessories with health-related claims that science generally deems as pseudoscientific: crystals, copper bracelets, and magnetic bracelets. Figure 1. 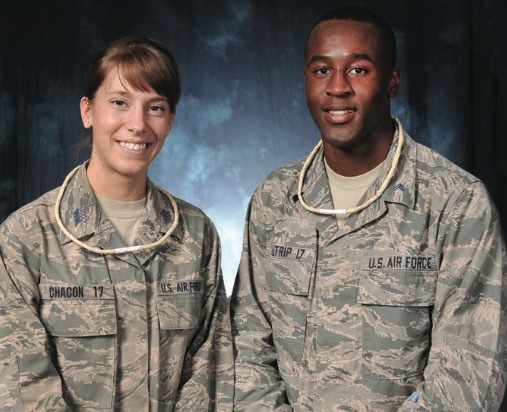 Two cadets wearing the necklaces used in the experiment. It is impossible to tell which one is sporting the Phiten necklace. We examined the potential influence of Phiten necklaces in a United States Air Force Academy (USAFA) classroom experiment. We needed an experiment with two groups to create a subsequent demonstration of inferential statistics for pedagogical purposes. Our deeper motive was to support the USAFA Officer Development mission by reinforcing the intertwined values of empiricism and scientific reasoning. Military professionals should value empiricism to prevent the military from investing in products and services that do not provide any real benefit. Military professionals should also learn to supplement intuition, when possible, with well-reasoned evidence. This is seen perhaps most dramatically among pilots. When the experience of in-cockpit flight disrupts the vestibular system, pilots can experience a psychologically powerful motivation to navigate based on their dysfunctional perception, possibly resulting in fatal impact. Pilots are therefore trained to rely on decades of accumulated evidence demonstrating that they should at these moments “trust their instruments” and navigate in a manner that feels tremendously dangerous. This interplay between intuition and science also occurs in other areas. Officers can manage in ways that feel correct but stand in contrast to empirically supported theories. Officers presumably benefit from considering evidenced-based theories regarding effective peace support or wartime operations to facilitate their own situation-based judgment. Our impression was that cadets value empiricism and scientific reasoning as textbook definitions but overlook these values in everyday application. We therefore designed a classroom experiment that would allow cadets to experience an examination into a seemingly outlandish claim rather than just read about it. We asked cadets who were in the second semester of a year-long course sequence about statistics and research methods in the behavioral sciences to participate. These cadets were typically in their third year at the USAFA. Cadets were not required to participate, and a small percentage of cadets declined participating. Forty-eight USAFA cadets (thirty-three female, fifteen male) chose to participate. An instructor (Foster) told participating and non-participating cadets that we wanted to examine products that reportedly improve personal well-being. He explained that the research involved wearing necklaces that were covered in tape to conceal their nature. Cadets were asked to wear the necklaces until the next class meeting, which occurred forty-eight hours later. Cadets were instructed, for safety purposes, not to wear their respective necklaces when sleeping but to instead wrap them around a wrist, put them under a pillow, or place them next to their person. The instructor also acknowledged that some of them might need to remove the necklaces temporarily (e.g., for athletic practices or showering) and, if this were the case, to document when this was necessary. Finally, the instructor encouraged cadets to participate fully and seriously in order to support the scientific process and overall learning experience. Cadets were then presented sequentially with a large bin from which they could remove a tape-covered necklace. The bin contained a mixed assortment of two different necklaces. Half of the included necklaces were Phiten’s Classic Titanium Necklaces (in orange or burnt orange) purchased using the Phiten USA webpage (Phiten Condition). The other necklaces were segments of Everbilt’s 3/16 Inch All-Purpose Clothesline in White (Clothesline Condition) purchased from The Home Depot. We chose the clothesline because it closely approximated the size and weight of the Phiten necklaces. We removed the clasps from the Phiten necklaces to create straight twenty-six-inch segments. We cut the pieces of clothesline to be the same length. We then wrapped all necklaces in masking tape and connected the ends by wrapping that portion of the necklace with white Duct Tape (see Figure 1 where one cadet is wearing a Phiten necklace and the other a “Clothesline” necklace). It is quite unlikely that any cadet would attempt to identify a necklace due to concerns about honor and simply being busy. The uncommon white duct tape was nonetheless used as an additional safeguard to discourage any cadet who might be tempted to remove it to identify his or her necklace. Finally, it is important to note that we judged the necklaces to be exceptionally similar in appearance and feel, and we are certain that they created an effective double-blind study—the cadets did not know what kind of necklace they were wearing, and the class instructors could not tell either. Some cadets might have suspected that there was more than one kind of necklace, but we doubt they were overly concerned in this regard. Cadets in the Phiten Condition reported feeling trivially less Relaxed (M=5.62, SD=2.02) than did cadets in the Clothesline Condition (M=5.67; SD=1.99). Cadets in the Phiten Condition reported feeling less Angry (M=2.12; SD=1.42) than did cadets in the Clothesline Condition (M=2.71; SD=1.88). Cadets in the Phiten Condition reported feeling less Energetic (M=4.96; SD=2.05) than did cadets in the Clothesline Condition (M=5.46; SD=1.59). We conducted independent samples t tests comparing the Phiten Condition and the Clothesline Condition for each dependent variable. None of the three results revealed differences between the conditions that would be deemed as statistically significant at the standard expected in the behavioral sciences (i.e., all three tests had corresponding probability values greater than 0.05). To be additionally mindful, we identified three subsets of participating cadets based on their survey responses: (a) three cadets who wrote that they had been ill during the trial (one in the Phiten Condition); (b) one cadet who forgot to wear the necklace on the final morning and therefore completed the survey without it (Clothesline Condition); and (c) six other cadets who appeared to have spent more than eight hours without wearing their necklace or having it next to them while sleeping (one in the Phiten Condition). We repeated the comparisons between the Phiten and Clothesline Conditions after omitting all possible combinations of these three subjects. The obtained results again did not reveal any statistically significant differences between conditions. The results of our classroom-based experiment do not by themselves fundamentally disprove the notion that externally located MPT puzzlingly promotes emotional well-being. Failing to detect a relationship between an independent variable and a dependent variable does not mean the relationship does not exist; it just means the researcher was unable to detect it. After all, USAFA cadets, like all people, experience situational factors that could influence their levels of relaxation, anger, and energy (e.g., academic responsibilities, required or voluntary exercise, interpersonal concerns, sleep deprivation, and so forth). This type of random error is omnipresent in research with human participants, so it does not invalidate our research. Nevertheless, in the spirit of good science, we do need to acknowledge that if MPT necklaces were to influence emotional well-being, it is possible that these extraneous influences could have hidden that effect. Those who believe in the power of externally located MPT might examine the tangible differences between our experiment and the Aoi et al. (2012) experiment. The MPT-treated surroundings surely contained greater amounts of MPT, but our necklaces were presumably in closer proximity to the participants’ bodies. We assume that MPT proponents would agree that proximity must matter; otherwise MPT-treated necklaces would exhibit their alleged benefits whether worn or remaining unpurchased in a distribution center. The Aoi et al. trial occurred over five days, but the treatment was suspended during the day. Our trial lasted only two days but the treatment was generally continuous. The Aoi et al. experiment used twenty-four participants, whereas our experiment had forty-eight. Finally, Phiten adherents might be tempted to argue that we reduced the MPT effect by covering the necklaces with tape. If so, we do not understand why masking tape and a little duct tape would reduce an effect that in the case of the Aoi et al. experiment somehow passes through rubber (or flooring material), air, and the exterior of the human body. In sum, we believe that our classroom experiment provided a legitimate conceptual replication of the research provided by Aoi et al. This leads to a nagging question. Why would Aoi et al. (2012) obtain significant findings when we failed to do so? The Aoi et al. results might appear legitimate on the surface, but they can also be explained in another way. Aoi et al. point to improvements that were significant in the Titanium Condition but not in the Placebo Condition. This is improper because two effects can be similar even though one effect crosses the threshold of statistical significance whereas the other effect falls short of doing so. When the Aoi et al. results are examined with this in mind, one can see that there is no compelling evidence that participants in the Titanium Condition exhibited emotional well-being improvements above and beyond those in the Placebo Condition from the beginning to the end of the experiment. Figure 2. Coauthor Craig Foster and Security Service Field’s head groundskeeper taking soil samples from the field to test the amount of titanium occurring naturally in the soil. One final issue involves the amount of titanium that exists naturally. We are reluctant to develop this point because we do not believe that externally located titanium in any form exerts an influence on well-being. 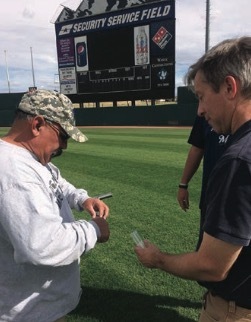 We nevertheless looked for titanium in four “field” samples obtained from Security Service Field in Colorado Springs, home of the Colorado Springs Sky Sox Triple A baseball team. We pulled samples from (a) the warning track, (b) the soil (with a little grass) in centerfield, (c) the infield mix approximately where the second baseman would stand, and (d) the pitcher’s mound (see Figure 2). The head groundskeeper explained that each of these samples would have a fundamentally different composition. We conducted a variety of steps to dissolve our four field samples. We then analyzed the resulting solutions for titanium using an inductively coupled plasma optical emission spectrometer. We used these processes to estimate the mass weight percent of the titanium for each sample (i.e., elemental titanium mass/total mass). The estimated titanium mass weight percents were as follows: Centerfield = .000652%; Warning Track = .000242%; Pitcher’s Mound = .0000907%; Second Base = .0000694%. (A detailed technical report is available upon request.) We asked Phiten for the mass weight percent of titanium in their necklaces, but they politely responded that it was a corporate secret. The results demonstrate a remarkable irony. It seems that many baseball players are purchasing Phiten necklaces to receive the purported benefits of MPT when they are routinely performing, presumably unbeknownst to them, on playing fields that contain titanium. Titanium might be perceived as rare because it is costly and associated with highly technological products. Titanium is actually the ninth most-abundant element on the planet (Donachie Jr. 2000), making the Earth, conceptually speaking, a titanic ball of titanium. Titanium is so common in soil that researchers can examine titanium in animal feces to estimate soil ingestion. This procedure was used, for example, by researchers examining mule deer soil ingestion near Denver, Colorado (Arthur III and Alldredge 1979). This suggests that if titanium were to exert positive influences on emotional well-being as Phiten claims, it might be possible to gain those benefits by sleeping next to a sufficiently large bag of Colorado deer poop. Phiten fans could argue that the titanium in soil or deer feces is different than the MPT provided in a Phiten necklace. We do not know what percentage of titanium in our field samples existed as elemental titanium (Ti), if any, or in a different form such as titanium dioxide (TiO2). Also, titanium, in any form, might not resemble the nanoscopic-sized particles Phiten claims go into their necklaces. Such arguments raise more puzzling questions: Why would titanium dioxide work differently than titanium? Why do the titanium particles need to be nanoscopic? From our viewpoint, these questions, such as potential questions about proximity and the covering of necklaces with masking tape, are puzzling because the relationship between externally located MPT and well-being is theoretically vacuous and the evidence supporting this extraordinary claim remains unconvincing. The most straightforward answer, based on the existing evidence, is that titanium in any form, when located externally to the human body, does not exert any direct influence on personal well-being outside of more sensible explanations (e.g., a placebo effect). Science and technology thrive on new ideas, and seemingly radical theories occasionally end up appearing to be true. We therefore do not take issue with peculiar claims. Our concern is that such claims should be supported by strong scientific evidence before consumers purchase corresponding products and journal editors publish corresponding research. A willingness to accept poorly substantiated claims can cause consumers to waste resources and scientists to waste valuable time. In this case, the externally located MPT theory is inconsistent with the known laws of physical science, the common natural presence of titanium, and now, the results associated with a classroom experiment that removed the potential placebo effect associated with Phiten necklaces. The claims surrounding MPT are at least, for the most part, benign. An MLB player taking a chance on a $20 necklace is not likely to cause any harm. Besides, the placebo effect might cause the necklaces to “work” due to their psychological power rather than their magical power. The obvious problem is that this type of pseudoscience can be genuinely harmful in other contexts. For many individuals, $20 is a considerable sum, and Phiten offers a variety of products that are far more expensive. Individuals frequently invest in similarly dubious products or services, such as faith healing or clairvoyance, which can cause physical, emotional, or financial challenges. Thus, our classroom experiment should reinforce lessons that are broader than MPT. We hope that our cadets and others learn to be effective in detecting scientifically questionable claims, and they evaluate such claims with a healthy consideration for the existing evidence. We thank the Warfighter Effectiveness Research Center (WERC), which is affiliated with the Department of Behavioral Sciences and Leadership at the United States Air Force Academy, for their support. The survey also included an open-ended item that provided cadets the option of writing a testimonial about how the necklaces made them feel. This item followed the three dependent variables. This item did not reveal any themes that were inconsistent with the quantitative results. Thus, we only used this item to help identify participants who reported having an illness during the experimental trial. Aoi, W., T. Kamata, Y. Ishiura, et al. 2012. Titanium-treated surroundings attenuate psychological stress associated with autonomic nerve regulation in office workers with daily emotional stress. Physiology & Behavior 108: 13–18. Arthur III, W.J., and A.W. Alldredge. 1979. Soil ingestion by mule deer in Northcentral Colorado. Journal of Range Management 32(1): 67–71. Donachie Jr., M.J. 2000. Titanium: A Technical Guide (2nd Edition). Materials Park, OH: ASM International. Hansson, S.O. 2013. Defining pseudoscience and science. In M. Pigliucci and M. Boudry (Eds. ), Philosophy of Pseudoscience: Reconsidering the Demarcation Problem. University of Chicago Press (pp. 61–77). Hines, T. 2003. Pseudoscience and the Paranormal (2nd Edition). Amherst, NY: Prometheus Books. Shermer, M. 2002. Why People Believe Weird Things: Pseudoscience, Superstition, and Other Confusions of Our Time (Revised and Expanded). New York, NY: St. Martin’s Griffin. Rowlands, D., S. Shultz, T. Ogawa, et al. 2014. The effects of uniquely-processed titanium on biological systems: Implications for human health and performance. Journal of Functional Biomaterials 5(1): 1–14. Thagard, P. 1993. Computational Philosophy of Science. Cambridge, MA: MIT Press. The views expressed in this article are those of the authors and do not necessarily reflect the official policy or position of the United States Air Force Academy, the Air Force, the Department of Defense, or the U.S. government.